Wi-Fi for IoT – a boon or a bane? Here’s a picture from a chip maker Rockchip, claiming (claiming!) that their Wi-Fi chip is the most efficient, overperforming even the specially designed ZigBee and BLE chips. While this seems as a reason to rejoice, promising greater speeds and technology convergence, I’d like to point one thing: 802.11b. Not n, not g, but b. Remember the protection modes, airtime fairness and other nightmares? They might come back in legions. And stay for what seems forever, as Rockchip claims “powering an IoT device for up to 35 years with a single AAA battery”. What do you think? 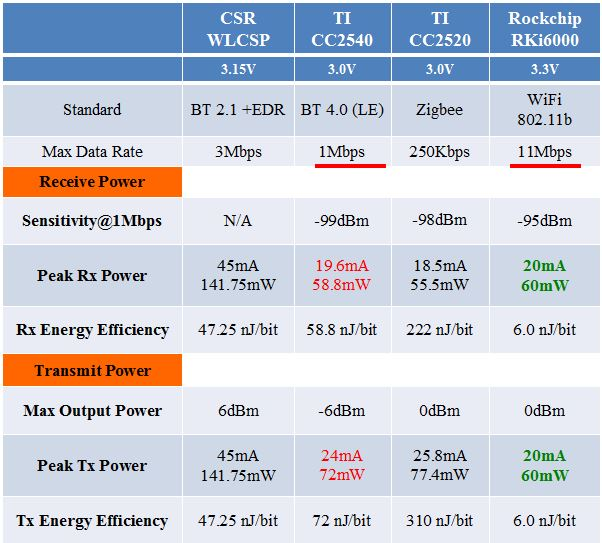 Is energy-efficient 802.11b chip a boon or a bane for modern WLANs? How long will it take to h@ck y3r Pa$$w0rd?